Every April Oxford UK Chapter hold a ride out to the Children’s Hospital at the John Radcliffe to take toys to the poorly children staying there. 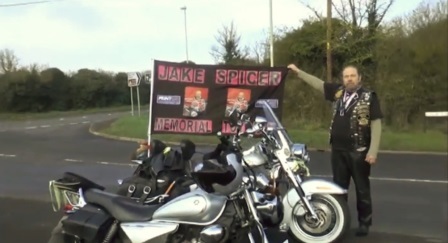 For many years now we have done this in memory of Jake Spicer, who sadly passed away in 2009. 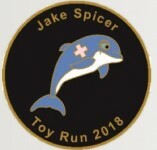 2019 will be the 20th anniversary of the toy run, and it will also be the year that Jake would have turned 25. We hope that the ride out will be bigger and better, the date for this year’s run is Sunday 28th April. In 2017 a pin was designed and sold, and we raised enough money to buy a Playstation and some games for the children in the hospital. We had a new design of pin in 2018, and we raised enough money to buy not one but TWO ovens, so as the children can have cookery lessons. 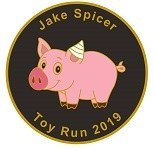 This year’s pin is now on sale, again at the price of £5, please see Anne if you would like one. Last year’s Toy Run took place on Sunday 8th April, with an estimated 140 bikes turning out. Thank you to everyone for coming along, to the Dealership and the staff for hosting the start event and making everyone welcome, to our neighbouring Chapters for turning out to join in and show their support, and of course to Geoffers and the Road Crew for making sure everything went smoothly. Thanks to Jack for putting the video together. All our photos are available for Chapter Members to view under the Members’ Gallery page.